Both sides of the New Jersey Turnpike started to reopen late Tuesday night after a fiery fatal crash under an overpass in the morning shut down the highway for hours and caused miles-long backups, sending frustrated drivers out of their cars to stretch their legs. Northbound truck lanes reopened at about 1 p.m., and car lanes were reopened by 10 p.m., nearly 12 hours after a dump truck overturned and caught fire underneath the Wood Avenue overpass in Linden, according to a spokesman for the New Jersey Turnpike Authority. All southbound lanes started to open at about 10:30 p.m., after crews removed hanging power lanes. Southbound lanes on the New Jersey Turnpike are expected to be closed through the afternoon rush Tuesday after a fiery crash under an overpass shut down the highway and caused miles-long backups, sending frustrated drivers out of their cars to stretch their legs. 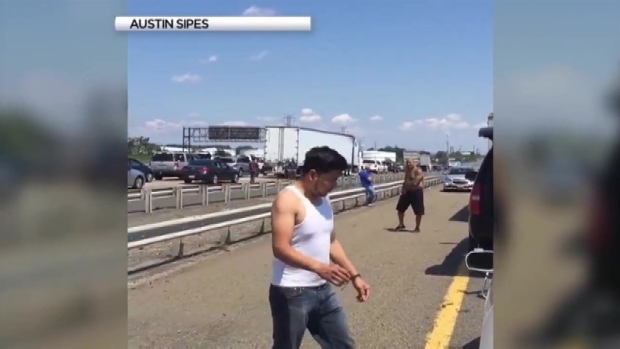 Video captured at the scene during the day showed traffic at a total standstill -- with drivers out of their cars, standing in groups or alone on the shoulder as they looked mournfully at the line of vehicles. Some people were seen playing football as they tried to pass the time, while others laid out to sunbathe. One driver stuck near exit 12 on the northbound side photographed a man skateboarding between cars. The unidentified truck driver was killed in the crash, state police said. It's not yet clear what caused the truck to crash and burst into flames. The blaze was quickly extinguished, but police said the flames may have compromised gas and power lines that run under the overpass. Utility PSE&G said the truck fire damaged its underground electric facilities, causing heavy damage to cables and knocking out power to about 75 industrial customers. 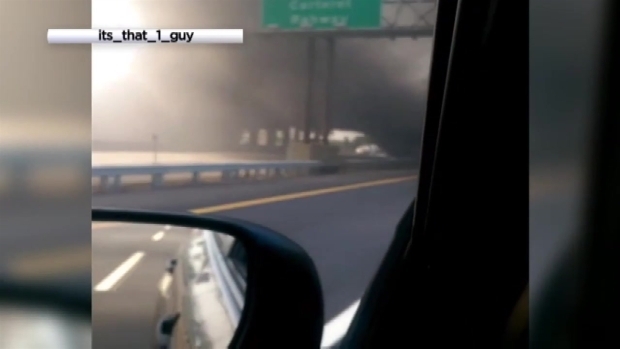 A large truck crashed, overturned and caught fire on the New Jersey Turnpike Tuesday morning, shutting down the highway and causing miles-long backups. Some drivers stuck in the traffic said that parts of the bridge appeared to be falling off after the crash, but Turnpike Authority spokesman Tom Fenney said inspectors determined the overpass is structurally safe. The truck was towed away hours after the crash. At the height of the traffic jam, delays on the northbound side stretched back nearly to the Garden State Parkway. On the southbound side, traffic was jammed as far back as Interstate 280. All scheduled construction and maintenance work on the Bayonne Bridge, Outerbridge Crossing and Goethals Bridge was canceled Tuesday night to accommodate drivers affected by the Turnpike closures. The Bayonne Bridge will remain open until 9 a.m. Wednesday. New Jersey Transit trains were honoring bus passes after the accident delayed bus passengers. Roughly 235 million vehicles traveled the Turnpike in 2010, the most recently available data on the Authority's website. In that year there were 13 fatalities, down from 23 the year before.